The Trump administration announced on Sunday its plan to address school safety in the wake of last month’s shooting at Marjory Stoneman Douglas High School that left 17 dead. 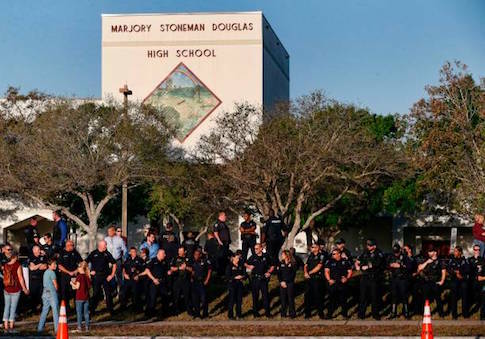 The administration's proposal would implement or call for the implementation of a number of immediate reforms meant to address school safety and reduce gun violence. Most prominently, the White House is backing funding for firearms training for school officials, including teachers. A similar proposal, which expanded the number of armed officers in schools, was implemented by the Obama administration in the months following the mass shooting in Sandy Hook, Conn. The administration also has backed gun violence protection orders, which create a due-process-supported way for officials to temporarily seize the guns of a potentially dangerous individual. Also known as gun violence restraining orders, the proposal has earned the backing of conservatives, who see it as a way to curb the threat of those who raise red flags while respecting the Second Amendment and avoiding more general bans. Legislatively, the administration is calling on Congress to pass two bills to enhance gun and school safety. The Fix NICS Act, a bipartisan proposal led by Sens. John Cornyn (R., Texas) and Christopher Murphy (D., Conn.), would implement much-needed changes to the FBI's National Instant Criminal Background Check System (NICS), allocating hundreds of millions of dollars to induce state and local law enforcement to submit more of their records to the system. The Stop School Violence Act, another bipartisan proposal shepherded by Sen. Orrin Hatch (R., Utah), would reauthorize grants to states to support evidence-based training and tools to help reduce school violence. Other proposals include additional funding for the nation's faltering mental health infrastructure, and a full review of the FBI's tip line. The tip line has come under scrutiny in recent weeks, after it was revealed that someone had contacted the line regarding the Parkland, Fla. shooter's gun ownership and his desire to kill people. In addition to its immediate proposal, the White House announced the formation of a commission on school safety. Jointly chaired by Secretary of Education Betsy DeVos, Secretary of Health and Human Services Alex Azar, and Attorney General Jeff Sessions, the commission will consider bigger-picture concerns. These, Politico reported, will include consideration of Obama-era guidance on school discipline, the impact of video games on violence, and the effects of press coverage of mass shootings. The White House's proposal is the latest action by the Trump administration meant to address gun violence. Last month, President Donald Trump instructed the Department of Justice to implement new regulation to ban bump-fire stocks, which can be used to increase the rate of fire of semi-automatic weapons. Federal gun crime prosecutions continue to rise under Attorney General Jeff Sessions, with a 23 percent increase between the second quarter of 2017 and the second quarter of 2016. The proposal did not include some of the gun control proposals the president championed during a televised meeting with top lawmakers. The new plan omitted a proposal to ban gun ownership for those under 21 years old, expanding background checks to sales of used guns between private parties, confiscating guns from certain people with mental health issued before applying due process protections, or a ban on certain semi-automatic rifles like the AR-15. Those proposals were praised by gun control groups in the wake of the meeting and panned by the National Rifle Association. Within a week of the televised meeting, the president and National Rifle Association announced they had held a private meeting in the Oval Office. The NRA said the meeting went well, and the president had expressed his support of the Second Amendment and due process rights. "Good (Great) meeting in the Oval Office tonight with the NRA!" Trump tweeted on March 1. "I had a great meeting tonight with @realDonaldTrump & @VP," Chris Cox, a top executive at the gun rights group, tweeted the same day. "We all want safe schools, mental health reform and to keep guns away from dangerous people. POTUS & VPOTUS support the Second Amendment, support strong due process and don't want gun control. #NRA #MAGA"
The NRA did not comment on the White House’s new proposal. This entry was posted in Uncategorized and tagged Betsy DeVos, Gun Control, New Gun Laws, NRA, Trump Administration, White House. Bookmark the permalink.